Like the human body, plants will limp along despite poor nutrition, but they will thrive and grow best with optimal nutrition, which is why we fertilize—to add nutrients. Fertilizers typically include the soil-supplied nutrients that plants use in largest quantity. Ideally, all these nutrients would be in the ground, but perfect soil is rare. If you improve your garden plot over time, you may eventually achieve an ideal soil, but in the meantime, you can supplement your plants with nutrients from a bag or a bottle. Carbon, hydrogen, and oxygen are the three largest components of plants, but these are not available from fertilizer. These come from the air and from decomposing organic matter. That’s one reason why it is important to have good, rich soil with enough pore space to hold water and air (for hydrogen and oxygen) and enough organic matter to break down and supply the carbon. The guaranteed analysis on the bag is where you can get a close look at what is in the bag, how much is in the bag, and what sources it is derived from. A fertilizer has three numbers printed on the package that state the percentage (by weight) of the three main plant nutrients—nitrogen (N), phosphorous (P), and potassium (K). For example, you might see a bag labeled 4-7-6. The first number (4), refers to nitrogen, the second number (7), refers to phosphorous, and the third number (6), refers to potassium. Common fertilizer formulas you may see sold for vegetables are 4-6-6, 10-10-10, or 14-14-14. Until recently, these three numbers were required by law to always be prominently placed on the front of the package; however, the law changed, allowing manufacturers to move these numbers to back or side panels of the package, so you may have to look a little harder for them. Often they are listed in a section called “Guaranteed Analysis,” which is required by law to list each and every nutrient in the package and the percentage of each. This is where you can dig deeper to see all the nutrients in the bag, allowing you to compare products and prices. 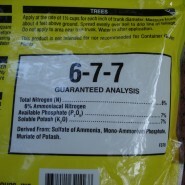 Look for the three-number formula on every bag of fertilizer. Just remember NPK, which stands for nitrogen (N), phosphorus (P), and potassium (K). The formula represents the ratio of these three ingredients always in that order. Nitrogen (N) fuels new growth. All vegetables and herbs need some nitrogen. Some, like corn, need more, while others, like sweet peas, need very little. Phosphorous (P) promotes root development, which helps strengthen plants. It also increases blooms. This is a very important nutrient, especially as plants start out. Potassium (K) is essential to many plant functions and their overall health. It also helps plants withstand stressful weather and defend against diseases. Calcium (Ca) improves general plant vigor and promotes growth of young roots and shoots. Magnesium (Mg) helps regulate the uptake of other plant foods and aids in seed-making. It is also important to the dark green color of plants. Sulfur (S) helps foliage maintain a dark green color while encouraging vigorous plant growth. Minor, or trace, elements are nutrients used by plants in very small amounts but that are still essential to plant health. Iron (Fe) is the one you will commonly see added to fertilizer because it is often lacking in poor soils; it aids in the conversion of sunlight to energy and helps plant foliage maintain a dark green color. Manganese, boron, zinc, copper, and molybdenum are sometimes present in fertilizer, too. Chlorine and cobalt are also needed for plant growth but are rarely added to fertilizer. How do you know if a fertilizer is organic? Most of the time, the package will say organic, and you can be sure if you see the OMRI logo, which stands for Organic Materials Review Institute, a body that certifies products as organic. This is voluntary and involves extra paperwork and expense for the manufacturer, so not all organic products will have this certification. One of the benefits of adding compost made from a variety of garden and kitchen scraps to your garden is that it is likely to supply many of these trace elements. In a nutshell, it is wise to know what your plants need and what you are buying when you purchase fertilizer. If your soil is too low in one of the essential nutrients not included in the fertilizer that you buy, you will still have problems. You can get your soil tested through a service offered by your regional Cooperative Extension service to analyze the nutritional content of your soil. This is not always necessary, but it is a good thing to do for a “baseline” reading of your garden. The needs of most vegetables are usually met by a complete fertilizer containing a good balance of the three major plant nutrients and often a few other nutrients. Fertilizers with higher N-P-K numbers, such as 14-14-14, indicate a more concentrated product, which means that you need to use less of them than you would use of a fertilizer with a lower number such as 8-8-8. Organic fertilizers usually have low numbers, such as 4-7-6, but they often contain plenty of other nutrients, and they support the health of soil microbes and other components of the soil food web. When using organic fertilizers, always mix them into the soil thoroughly and then water the prepared site before you set out your plants; this is essential because organic fertilizers depend on soil microbes to break them down into a form that can be taken up by plants. In contrast, most synthetic and liquid fertilizers are quickly available to plants. 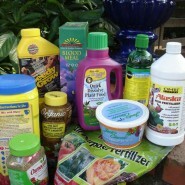 Most blended organic fertilizers that you buy in packages at garden centers will not burn plant roots when applied correctly, but high-nitrogen sources such as alfalfa, cottonseed meal, feather meal, chicken manure, and other “hot” agricultural by-products can injure plants if they come into direct contact with their roots. Finally, don’t forget to add compost to your soil each time you plant. Over time, the fertility of your soil will improve, and you will need less fertilizer to grow a healthy, productive garden. This entry was posted on Thursday, May 1st, 2014 at 8:54 am	and is filed under Garden, News & Updates. You can follow any responses to this entry through the RSS 2.0 feed. Both comments and pings are currently closed.